Continuing the theme of exposure therapy and facing your fears today, I’m reminded of one of my favourite TED talks: Michelle Poler’s ‘100 Days Without Fear.’ I have watched this talk an unhealthy number of times! It’s just so inspiring. Deciding that she’s afraid of being afraid all the time, Michelle takes on the mammoth project of facing 100 different fears over 100 days. There’s snakes and tarantulas; skydiving and theme park rides; tattoos and bikini waxes; stand-up comedy and of course, the TED talk itself. Seriously. Watch it. It’s glorious. One of the things that I took from this is this. Whilst it can seem like you’re afraid of everything; as if you have hundreds of fears and anxieties. Realistically though, if you break down your fears to their base level, it’s likely that you have at most maybe ten fears. Who cares though? Why does it matter? It matters because if you get to the root of your fears, then you can begin to notice both how this is effecting your life and daily happiness, and create a plan to change this. Michelle Poler discusses her epiphany that whilst she initially thought herself to be facing 100 fears, she soon realised that actually, she was only facing 7 fears over and over again. And I think this is true of all of us. If you read my blog yesterday, based on Tim Ferris’s idea of ‘Fear-Setting’ as opposed to goal-setting, then you might already have decided on an approach that forces you to base your goals around searching out fear and facing it head-on. Before you do this, however, you need to really know what your fears are. Having spent 5 minutes brainstorming things that I was afraid of, I then started considering what the root fear was. There was quite a bit of crossing out and re-drafting. Getting to the heart of what I was truly afraid of was like unpacking a set of Russian Dolls. Each time I went a layer deeper, I realised there was more lurking underneath. And it stuck me. Oh my days! I don’t have a hundred fears. I don’t even have seven. One fear to rule them all. 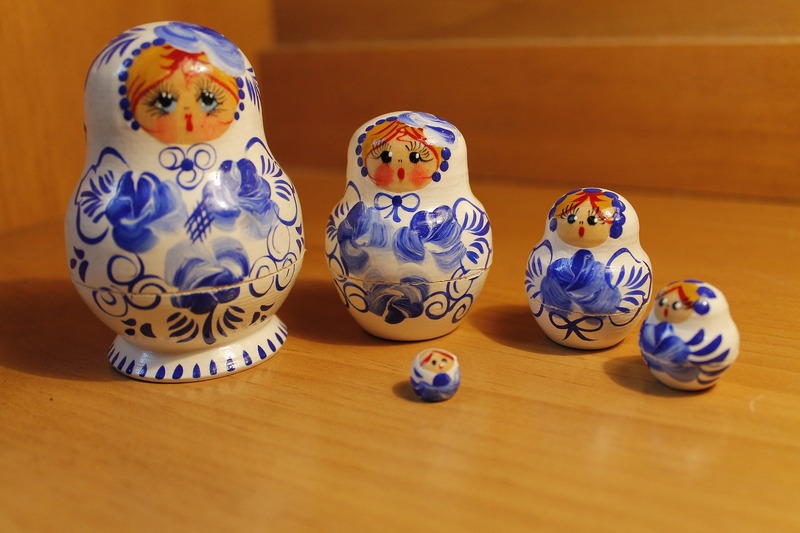 When I got to the last, smallest Russian Doll, my need to be in control was at the heart of all of my fears and anxieties and addictive behaviours. Anyhow. That’s enough for today. I know that I’m leaving on a cliffhanger, but now that I know this, I’m going to need some time to work out where I can go from here. Previous Happy 2018 – Day 82 – Given up on Resolutions already? Try some Spring Fear-Setting instead! Next Happy 2018 – Day 84 – Put your cape on!